1. To learn. 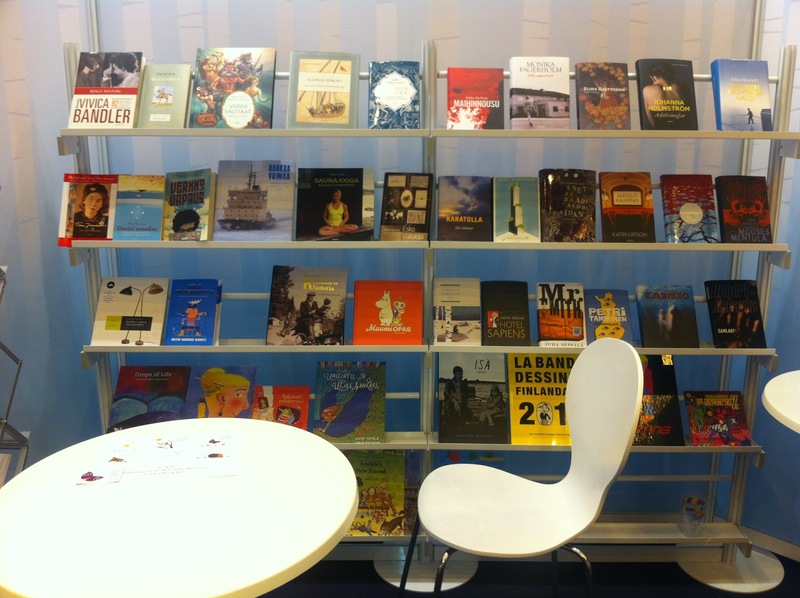 During this year's London Book Fair I attended over ten seminars, and although not all of them were right for me, the majority taught me something new. I will write about specific subjects under another post, but for example in AuthorLounge on Tuesday (16 April 13), two industry giants, Pottermore CEO Charlie Redmayne and Eric Huang, Director New Business and IP Acquisitions at Penguin, gave an interesting and informative talk about how books are changing with additional digital content. Apps, games and toys are all part and parcel of the digital future for books. I came away excited about the future, rather than fearful. 2. To network. Each year, sometimes by pure accident, I meet someone who is interesting and who I can exchange views and keep in touch after the Fair. 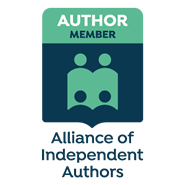 This year, because of the wonderful Alliance of Independent Authors, I met many like-minded writers. I also got two definite promises of book reviews from influential people. And I got to pitch to an agent who asked me to send my book to him. (I've been here before, still it was great to have affirmation from someone in the traditional industry that my writing pitching is on the right track). 3. To make friends. This year particularly, I really feel I've made some true friends. Having all the fellow ALLi members there has been such a huge support. Thank you Orna Ross for making it happen! Thanks must also go to AuthorRight who provided us with the AuthorLounge seminar area - and drinks at the end of each day! (VERY important). Gareth Howard was a tireless host - I wonder if he slept at all during the three days? 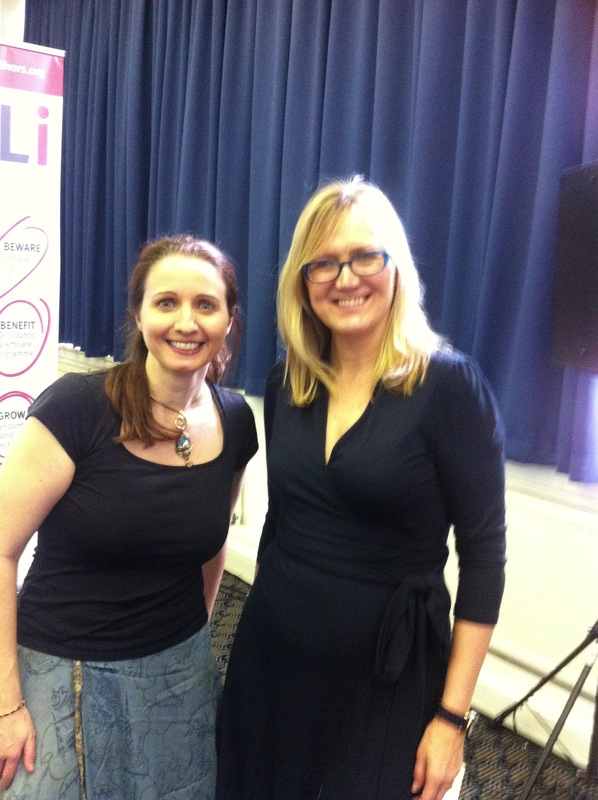 Not forgetting the giant Amazon who hosted the ALLi 1st Birthday Party on Monday. What a coup! 4. To sell your books. Here planning is key. Making appointments with agents and publishers at LBF is notoriously difficult, but it does happen. However, even if you haven't planned ahead, just your presence at the Fair, talking about your book and asking other writers about theirs will provide results. 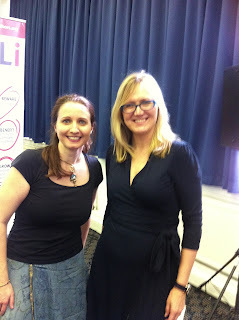 As Joanna Penn from The Creative Penn says, reviews sell your books, and talking about your book(s) will gain you those. You are the best salesperson for your books, so be yourself and talk about your work. 5. To see the bigger picture. I always remember the first time I entered the hall and was surprised by how many segments the industry was made of. 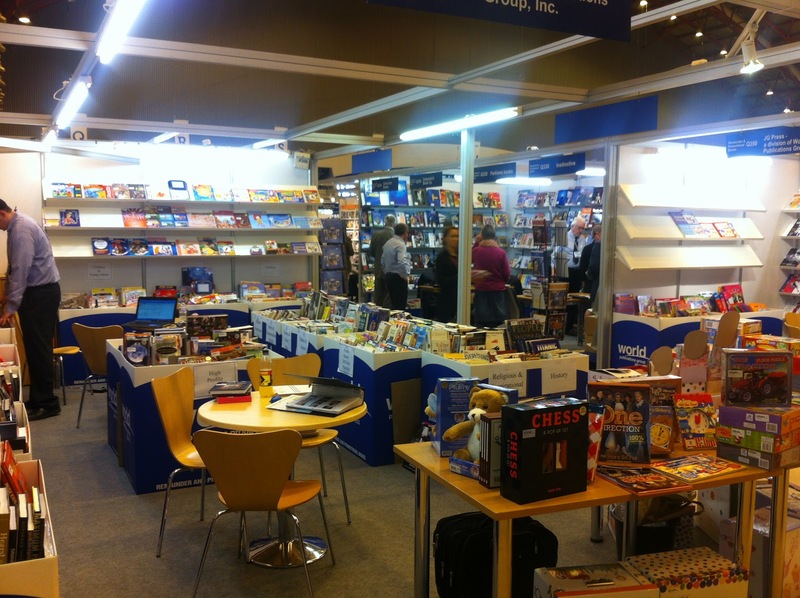 The vast space at Earls Court is divided into areas by genre, from the academic press to children's literature, as well as industry segments from international focus (like Finnish Literature Exchange, FILI), the digital zone, to a few second hand booksellers. 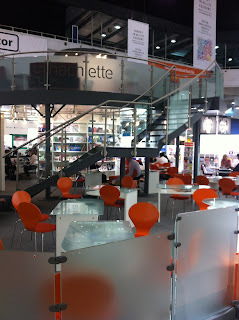 In the middle are the grand stands (some with staircases to bars) of the major publishers like Hachette (below), while the smaller boxes of the independent presses and second-hand booksellers line the walls, with perhaps a chair or two around a lonely table. last day - during the show this space was filled with literary folk having meetings. 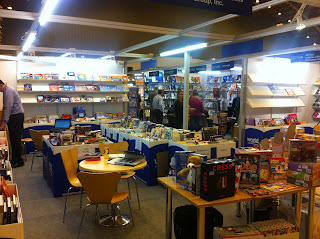 One of the larger second hand booksellers at LBF13. Nice to see! 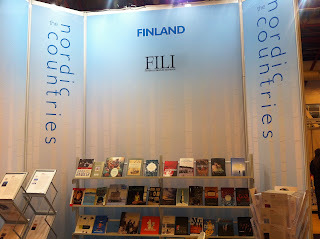 Finland was represented by FILI in the Nordic countries stand. 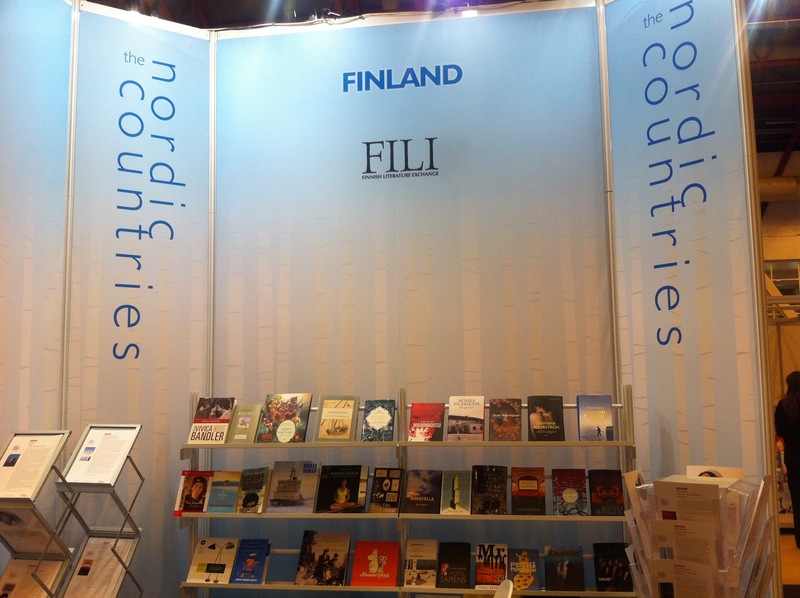 Inside the Finnish FILI stand. This year there was a definite change in the air at the Fair. There was a rumour going around (I heard it from Rohan Quine ) that the International Rights Centre upstairs was a bit quiet and that all the action was downstairs. There certainly was a huge buzz around AuthorLounge (and no, it wasn't just the bar). Most of the time it wasn't possible to get inside to listen to the seminars, let alone get a seat. So, if you are an author, or an aspiring writer, try to make it to The London Book Fair next year. It inspires, it makes good business sense and it's fun! I think those 5 pretty much cover it. (And thanks, Helena, for the link there.) What a huge amperage of words must have been uttered throughout 15-17 April across all of Earl's Court -- now to hang chattersomely behind the air of that hangar-like space until they're washed away by the next blast of conference verbiage to occur there (the "Service Desk and IT Support" show on 23 April...)! You're welcome, it was great to see you again. see you at the next MeetUp in London? Really interesting post. This is a world I know so little about! Good luck with the rest of the A - Z Challenge. It looks really interesting, I'd like to go sometime...thank you for sharing with us. 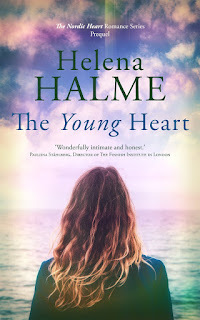 I was only there for the day Helena, but so much happening I really wished I was in London for the full three days! The Author Lounge was crowded and standing for such long periods isn't ideal. But a wealth of information and your post certainly gives a 'flavour' for what was a buzzing Fair this year! The London Book Fair sounds like a lot of fun. It's always great to surround yourself with other writers, there's so much to learn from them.